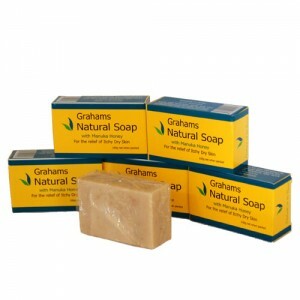 Unlike normal soaps which dry the skin the Grahams Natural Soap is made from a natural blend of oils and Manuka Honey so will sooth and moisturize the skin as it cleanses. The soap is free from artificial colorings and perfumes so will not irritate or dry the skin. It is suitable for the whole family including children. Use as for any normal soap with the comfort and knowledge that you are caring for your skin rather than irritating it. The soap is sold as a 100g bar in a packaged box.